Visible results in 1 hour. Allows replanting or sowing 24 hours after application. Instructions for Use For use only as a home garden weedkiller. For use on unwanted vegetation in paths, drives and patios. Read all safety instructions before use. When to Use: Weedol® Gun!? Fast Acting Weedkiller should be applied from March to October, when the weeds are actively growing. Repeat treatment after 14 days where re-growth occurs. For total control of established deep-rooted perennial weeds such as bindweed use a product containing glyphosate, for example Weedol Rootkill Plus. Use on a dry calm day and avoid spray drift. Re-treat if the application has not dried before rain occurs. Maximum number of treatment: 4 per years. Where to Use: Weedol!® Gun!? 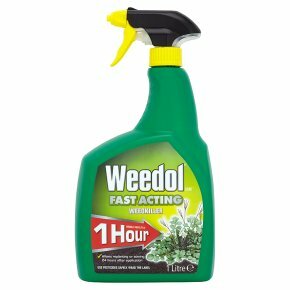 Fast Acting Weedkiller is a multipurpose weedkiller for use on unwanted vegetation. It can be used to kill broad leaved weeds and grasses in paths, drives and patios. Around the bases of roses, ornamental shrubs and trees, and under hedges (providing they are established, with woody bark). It can also be used for weeding before sowing or planting vegetables, flowers or lawns. Treated areas can be re-planted or re-seeded the day after treatment. How to Use: 1 Press down firmly on top of trigger head behind nozzle to depress safety tab. 2 At the same time, twist nozzle to spray position (1/4 turn either way). 3 Apply the spray evenly to leaves and stems. Weeds must be thoroughly wetted to the point of run-off. 4 Turn nozzle to 'off' position after spraying. For best results: treat small weeds at an early stage of growth. Repeat application after 14 days if weeds are not completely dead. t of reach of children. Read label before use. Do not eat, drink or smoke using this product. Do not contaminate water with the product or its container.<br><br>Contains 60 g/l acetic acid formulated as a ready to use liquid.